Blossom Events bring for you the best entertainers in your show for Live Concerts, Star Nights, Fashion shows, Musicians, Singers and Dancers, Western Dance Troupe, Folk dance troupe, Orchestra, Anchor with lots of new ideas and technical equipments for Visual Presentation, Sound, Photography, Fireworks and Lighting Setup. A top of the line Disc with 2500 sq. ft. area. The disc is the happening hub of livewire parties where the young and hip shake a leg. In weekdays, it is the favorite destination of party goers. 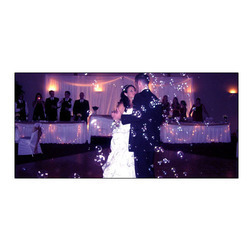 We offer grand instrumental music and other entertaining items according to the function’s flow . It may be a live music, DJ , Band etc. Selected Books for all Literature lovers. For canvas artists, painting material available to express their art. Technicolor Entertainment Services is dedicated to content creation, enhancement, management, global distribution and logistics. Engaged in the providing services such as decorative services.